Present state: Main station building survives (May 2015) in a very derelict state but planning application has been granted for its demolition. Notes: Just east of Newmarket lies the village of Snailwell, the name deriving from the point where the River Snail rises. The river meanders north and eastwards through Soham, where it becomes Soham Lode, and eventually finds its way to the Great Ouse. North-east of Snailwell was a settlement dating back to the Bronze Age. The settlement, a 'Ham' was at a crossing place, a 'Ford', on the River Snail and from the tenth century was known as Fordham. A ford is a point where a road crosses a waterway by actually passing through the water. The river in what is now the village of Fordham has long since been crossed by bridges, the roads across which connect the village to its only links with the outside world - the A142 and B1102. The former now bypasses both Fordham (this section opened in July 2006) and Soham while the latter runs through the village on a roughly east - west axis. Part of the B1102 is Station Road, once connecting the village to its railway station which lay about one mile by road to the south-west of the village centre. Fordham & Burwell station, to use its original title, was opened by the Great Eastern Railway, as was Soham, with the Ely - Newmarket line on 1 September 1879. The line was born out of a proposal by the Newmarket Railway for extensions, from Newmarket, to Ely, Thetford and Bury St Edmunds and of those only that to Thetford was never built. The Ely line, however, took over thirty years to come into being. Further details can be read in the Newmarket Railway history within this website. Fordham & Burwell was technically not a station on the Mildenhall branch but was served by it; the branch joined the Ely - Newmarket line at Fordham South Junction and diverged at Fordham North Junction. Fordham & Burwell station predated the Mildenhall branch (and outlived it) and when the Barnwell Junction - Fordham section of the Mildenhall branch opened in June 1884 the 'Burwell' suffix was dropped. As the Fordham - Mildenhall section did not open until 1885, Fordham was the interim terminus with four trains per day each way. Perhaps as an omen for the future, it is on record that only one passenger travelled from Fordham via the branch to Cambridge on the opening day*. In contrast, the first up train on the opening day saw a rush of 25 passengers at Burwell. *It is unclear if this applies to the inaugural train or to the entire day but it appears to be the latter. In 1881 the population of Fordham was 1,193 and, with one or two ups and downs, the village was one of the few places served by the Mildenhall branch, ignoring Cambridge, of which the population increased overall. By 1961 it had increased to 1,708 and the 2011 census gave it as 2,712. The 1961 figure is curious as the previous census in 1951 gave the population as being 1,705. The other locations on the branch which increased in population during the period the branch was in operation were Burwell and Mildenhall. This is likely due to people, especially the young, moving away from the smaller and relatively isolated communities, especially during the agricultural depression of the early twentieth century. 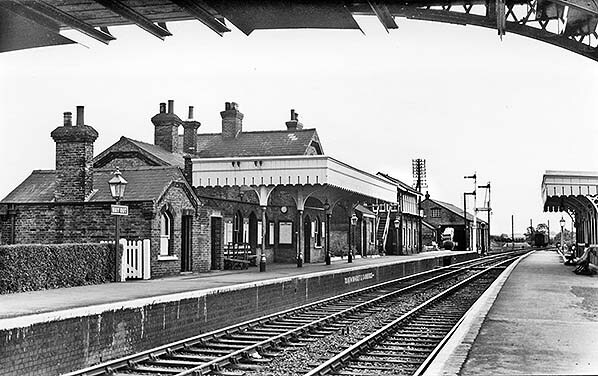 Nevertheless, Fordham station, over its entire life, managed only approximately half the passenger receipts of Mildenhall and even those of the latter were considered dire. The Ely - Newmarket line was built as single track with platform loops at Soham and Fordham. The section from Soham to Snailwell Junction which included Fordham was not doubled until as late as 1938, while the Ely - Soham section, which crosses fenland and the River Ouse just outside Ely, remains single track to this day although plans pop up from time to time to remedy this. Fordham station differed greatly in detail from those on the Mildenhall branch-proper. 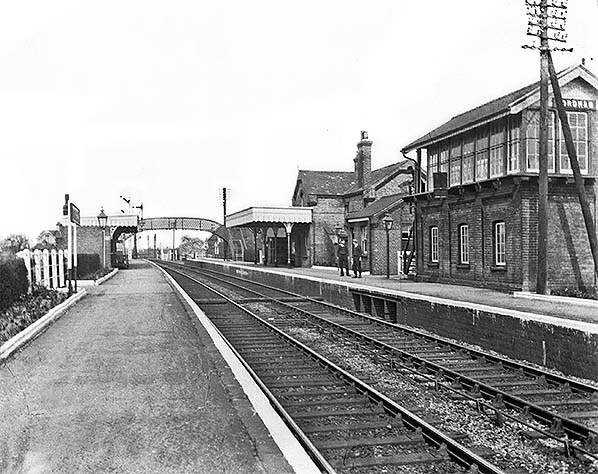 The station buildings were on the up platform, that is, the Newmarket direction platform. The stationmaster's house was at the Newmarket end and, like those on the Mildenhall branch, was set at a right angle to the track. The house differed from those on the Mildenhall branch in that it was orientated the opposite way round, so what would otherwise be the front of the house faced - and was joined to - the single-storey range of the station. The roofs of the station buildings were of slate, pitched, but they lacked the clipped gables found on Mildenhall branch (hereinafter 'the branch') stations. Gable ends also lacked the ornate wooden adornments of the branch stations but did have semi ornate brickwork which gave a tidy and pleasing effect. Chimneystacks were of a different style from those on the branch; plainer, but at the same time neater depending upon individual taste, while any lack of ornate decoration elsewhere on the station was provided by the windows and doorways. These had pronounced arched lintels, with doors and windows to match, and were almost cathedral-like in appearance. 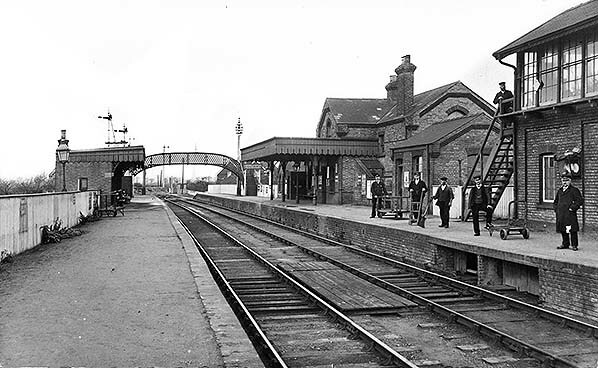 At Fordham the single-storey range contained the usual facilities: booking office, waiting rooms, staff office and toilets but the ‘Way Out’ was located at the Ely end of the platform. Also at the Ely end were gents' toilets and a small single-storey building for staff use, possibly a ticket collector's office. There was a similar building at the Newmarket end, added subsequent to the station opening, which may have been a lock-up. The signal box was also located on the up platform and quite close to the station building. An impressive structure, its roof design was of a distinctive style which can still be seen on the Grade II listed signal boxes at Thetford and Bury St Edmunds. It was fitted with a 40-lever McKenzie & Holland frame and was well known for the large mirror on the platform side and facing towards Ely. Presumably this was to assist sighting due to the platform canopy and the curve through the station. One interesting signal in the area was Fordham Down Distant, cautioning branch drivers approaching Fordham South Junction. It was a Fixed Distant with the arm mounted at the top of an extremely tall post and the oil lamp mounted half way down the post. Fordham signal box survived closure of both the branch and the station, being abolished in October 1973. Fordham Junction - as the station came to be known although this was not officially its name - had a water crane just beyond the Newmarket end of the 375ft up platform and another at the Ely end of the 370ft down platform. These cranes were, Cambridge excepted, the only source of water for locomotives on the branch. The down platform had a single building, part wood, part brick, and with a canopy; it contained a waiting room and, apparently, a staff room. Larger than the equivalents at branch stations, it nevertheless appears to have had only a single fireplace. This asymmetry may have come about when the structure was rebuilt sometime after the branch opened, and at the same time as the up platform canopy was either provided or enlarged. 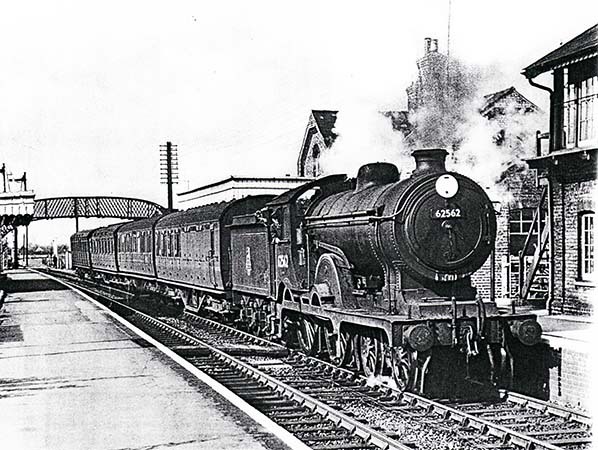 There was a footbridge, No.2229, at the Ely end of the station; not originally provided but installed at the insistence of the Inspecting Officer of the Board of Trade. The bridge was required for when the Fordham - Mildenhall section opened in 1885 and the contract was awarded to Arrol Brothers in December 1884. As a matter of interest, Arrol's contract also included the footbridge at Theydon Bois; they were identical and cost £215. The example at Theydon Bois is still in use in 2015 but has long since lost its smoke deflector plates. The Fordham footbridge was removed soon after closure of the branch to passengers. Following opening of the Barnwell - Fordham section, but prior to the Mildenhall section opening, GER records from July 1884 show that a turntable was to be installed at either Fordham or Mildenhall but the location was still undecided at that date; ultimately, Mildenhall was the recipient. The reference to Fordham or Mildenhall was rather strange. It is known that the branch was originally intended to continue beyond Mildenhall to Thetford and that the Thetford section had been abandoned even before the Fordham - Mildenhall section opened. The 1884 indecision over the location of the turntable therefore suggests two things: either hopes still lingered for an extension beyond Mildenhall or consideration was being given to abandonment of the Fordham - Mildenhall section albeit, by then, under construction. These theories arise only from the indecision over the turntable location and it must be stressed that absolutely no evidence has been found which either of them. Sidings and goods facilities at Fordham were fairly extensive and the track layout complicated, especially prior to the 1938 doubling of the track. The goods yard was located on the up side and at the Newmarket end of the station. One peculiarity, which probably came about through the station predating the branch, was that branch trains in either direction could not enter the goods yard without carrying out a series of reversals and shunting on the main line. By 1920 and prior to 1938 access to the goods yard from the main line was via two trailing connections in the up direction and a single trailing connection from what was then the down loop. The yard included one 500ft road, one 480ft road which served the goods shed, one 380ft coal road and a 710ft back road. The goods shed road continued through the shed to serve the dock behind the Newmarket end of the up platform. The dock could also be reached via points from the 500ft road, thereby avoiding the need for the shed road to be clear for access to the dock. It is highly likely that in practice the dock was served exclusively from the 500ft road as dock and shed would have catered for different types of traffic. The dock did not serve cattle pens, these being located on the back road and, rather oddly, near its southern end close to the points. This did not, however, conflict with the main line as the points connected to a 640ft headshunt which ran parallel to the main line on the up side. In addition there was an 1100ft reception road also parallel to the main line but on the down side. 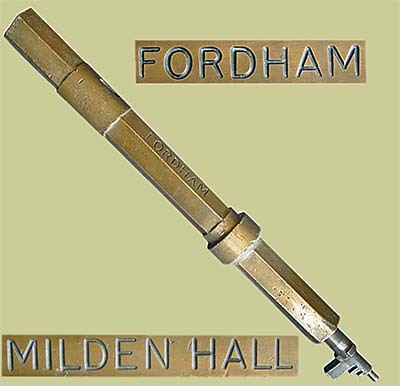 The single line token (or 'train staff') for the Fordham - Mildenhall section. In the freight-only period, 1962 - 4, Isleham was reduced to the status of an unstaffed public siding and the Fordham - Mildenhall section was operated on the 'one engine in steam' principle; in effect a long siding. Curiously, given the status of Isleham after 1962, the remote station at Quy was staffed to the very end albeit only on a seasonal basis. The token seen above, which came up for auction in 2014, was of brass and had station names stamped into it. The two insets are just photographs of the two stampings and not separate devices. Note how Mildenhall has been wrongly presented as two words. The steel device on the end of the token is an Annett's Key, used for unlocking points or lever frames along the line. There was two similar tokens and keys for the other section of the line; Fordham - Burwell and Burwell - Barnwell Junction. After 1964 when only the line to Barnwell oil terminal survived, the token and key for this short section was obtained from, and surrendered at, Coldham Lane Junction. These tokens came in various forms across the railway network, including those in a looped pouch described elsewhere, and were authority for a driver to take his train into a single track section. With only one token per single track section, no two trains could be in section at any one time and thus collisions were prevented. That is a very basic description, precise arrangements could vary according to how block sections were regulated and there were - and still are - several different types of block section. Between 1938 and 1951 nothing changed but a BR record survives from the latter year regarding realignment of the curve between 4m 34ch and 5m 06ch measured from Chippenham Junction. This is the entire curved section within which sat Fordham station. What, if any, work was actually undertaken is not known but it is certain that no alterations were made to Fordham station. The usual weighbridge and loading gauge were provided and, opposite the Newmarket end of the down platform, there was a water tower which supplied the water cranes. The tower was supplied from a nearby well via a pump house but how the pump was powered over the years is not clear. The well was present from the outset but the earliest plan, which has been seen to show the pump house clearly marked as such, dates from 1920; however, it is known to have existed long before that date. GER records concerning this are not especially comprehensive but we do know 'Pump Enginemen' were employed at Fordham; a Mr Cox, for example, was employed in the position in 1907. Staff cottages were provided, four in total. The original pair, provided from the outset, was located on the south side of Station Road and on the down side of the railway. The second pair was provided in 1890, south of Station Road but on the up side; this pair was rather more ornate. All four cottages survive. There was also a level crossing keeper's hut, again south of Station Road and on the up side. Although Fordham was an Ely - Newmarket line station, it is generally associated with the Mildenhall branch which also served it and, as a result, it is easy to overlook the fact that Fordham had other passenger trains calling. In 1961 and apart from Cambridge - Mildenhall via Burwell services, there was a Mildenhall - Newmarket service and an Ely - Mildenhall service which reversed at Fordham. Non-branch services included Ely - Newmarket, Peterborough East - Cambridge via Newmarket, Peterborough East - Ipswich, Peterborough East - Harwich Town and an 11.00pm Peterborough East - Liverpool Street via Ipswich service. The latter actually consisted of through carriages, which suggests the train joined or divided en route. Either way, the journey from Peterborough to Liverpool Street took a horrendous five hours. It arrived at Fordham at 12.15am and departed at 12.20am with lengthier dwells at other stations including 13 minutes at Haughley. Other details are not known but the pattern of operation suggests it may have been a parcels train with passenger coaches attached. The corresponding down service called at Fordham at 2.07am. This train, up and down, did not run on Saturday night but did on Sunday night. While the above may give the impression that Fordham was well served, the reality was rather different. Some trains operated on Saturdays only, others ran every weekday but at best only three or four times per day, while on Sundays only one train called, an afternoon Ely - Ipswich service. The other station on the Ely - Newmarket line, Soham, had an even more dire service but did have, of all things, a Glasgow - Colchester call but which did not stop at Fordham. The level of passenger services at Fordham in 1961 was fairly typical of the station's entire life and, indeed, was typical of many rural areas across the country at one time. 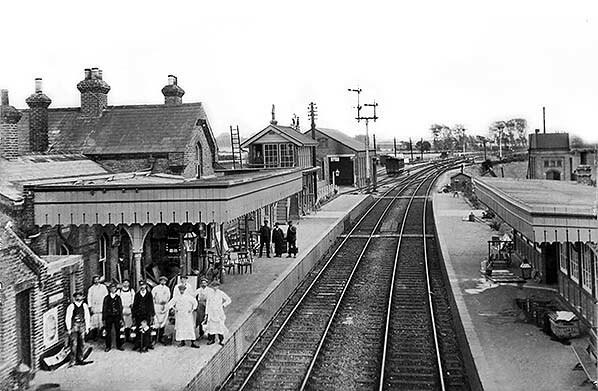 The best which could be said of Fordham might be that its services were adequate for schoolchildren and market day shoppers but, like many other stations, it was too inconveniently sited for the village it served. Of course, we must not forget that plenty of other trains, goods and passenger, did and still do thunder non-stop through Fordham and post-1968 the route became one of only two linking East Anglia with the rest of the country and avoiding London. Perhaps the best known train to pass through Fordham, but without stopping, for a great many years was the Manchester - Harwich Parkeston Quay (now Harwich International) boat train. This train's northern start/end point and its route had changed many times over the years but it is best remembered as running to and from Manchester Piccadilly. It was also for some years the only BR train to operate on Christmas Day and, as if to stick two fingers up at the Cambridge Buffet Express, would often include one of the surviving LNER-designed buffet cars. The Barnwell Junction - Mildenhall line had a blanket RA3 designation (Route Availability: a means of specifying maximum permitted axle loads) but in practice this was at the discretion of the civil engineer and RA3 was only loosely applied to the branch. However, it was more strictly applied to the Fordham - Mildenhall section and thus Fordham became the boundary for which locomotive classes could and could not work the entire branch. The D16 4-4-0 locomotives, for example, were prohibited between Fordham and Mildenhall whereas the B12 4-6-0's could work the entire branch because the extra axle gave better weight distribution. The little Ivatt 2MT 2-6-0's also could - and did - work over the entire branch, being lightweight at RA2. In later years the much heavier Brush Type 2 diesels also worked the entire branch, these varying within the class between RA5 and RA7. The RA4 BTH Type 1 diesels (and the NBL D84xx class) were also given dispensation to work the branch. Restrictions between Fordham and Mildenhall centred upon the Fordham - Isleham section which was prone to drainage problems, and it was this section which was responsible for the blanket RA3 restriction, even though it was only loosely applied. On a rather different note, for many years Fordham was witness to the sad site of condemned rolling stock on the last leg of its final journey to the nearby scrapyard at Snailwell. As well as hauled stock, Southern EMU and DEMU stock passed through as did some London Transport stock and DMUs. Of the latter, perhaps the best known - as they were much photographed in the sidings at Ely - were the rather peculiar Swindon Inter-City 79xxx units which had begun life on the Western Region before migrating to Scotland where they met up with the slightly newer but equally peculiar Class 126 units, a few of which may also have ended up at Snailwell. Fordham station closed to passengers on 13 September 1965 and retained a stationmaster to the end. Mr Robert Jardine was the final incumbent, taking over the position in 1962, and he was also in charge of Soham and Burwell. Fordham closed to goods traffic on 12 September 1966. It has been said that when the branch closed to passengers in 1962 and Fordham lost its status as an interchange station, passenger usage dropped to such a dismal level that retaining the station could not be justified. Whilst this could not be argued against, the fact that Soham station, which served a town with a much higher population, closed on the same day suggest that the writing was on the wall for Fordham irrespective of the branch closure. By 1965, of course, The Reshaping of British Railways (the ‘Beeching Report’) had been published and implementation was well underway. As mentioned earlier, Fordham signal box was closed on 28 October 1973. Station Road level crossing was converted to automatic barrier at the same time and all remaining semaphore signalling removed. After closure, the station remained essentially intact into the 1970s but with the closure and removal of the signal box the station was gradually dismantled. By the 21st century the station house and one or two smaller structures remained but in a derelict condition. Today the Ely - Chippenham Junction line sees a two-hourly Peterborough - Ipswich / Colchester passenger service but is extremely busy with freight traffic 24hrs per day, a significant proportion of which operates to and from Felixstowe docks. Since 1965 it has no longer been possible to run directly between Ely and Newmarket. There is now little trace on the ground of either part of the Mildenhall branch in the vicinity of Fordham. In 2004 Cockpen Road bridge, No.2244, located just outside Fordham and towards Isleham was demolished with the rubble and spoil from the approach embankments being used in the construction of the Fordham bypass. Cockpen Road also crosses the main line just outside Fordham but via a level crossing which Network Rail misspells as 'Cockspin LC' in its documentation. Perhaps the most visible remaining feature in the Fordham area is the former spur to Burwell cement works, Stephenson's Siding. However, it is difficult to gain access as it is on private land and some distance from any public road. 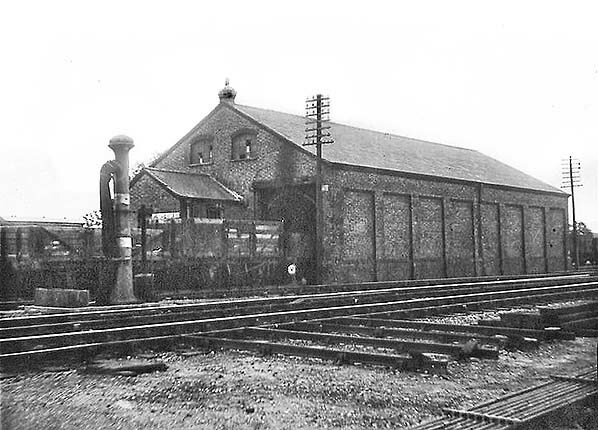 In recent years the station goods yard and buildings were used in turn by a roofing / scaffolding contractor, and as a waste management depot. In June 2010, a planning application proposing demolition the station building and the construction of a recycling centre on the site was discussed by Cambridgeshire County Council. Councillors voted 4 - 3 in favour of the proposal, in spite of representations by local people and parish councillors. In May 2015 the station building survives, unused and in a derelict state. The 5.5-acre site is currently for for sale. Tickets from Michael Stewart. Route map drawn by Alan Young. Bradshaws from Nick Catford. Totem from Richard Furness. This undated view of Fordham station is pre-1920s but post 1907 but as the down loop trap siding can be seen between the two signals in the distance. The right signal of the two is the Fordham South Junction down home signal and is on the branch from Burwell and Cambridge. GER lower quadrant signals are seen and the station is still oil-lit. On the up platform (this view is looking towards Newmarket and from the footbridge) stands a team of painters and decorators. GER records show the station was repainted in 1911 so that is the likely year the photograph was taken. It would appear that the down platform is also receiving a makeover. On the right the water tower can be seen. The chimneystack on the far right is attached to the down waiting room. The purpose of the small hut at the far end of the down platform is not known. Note the water crane just beyond the bracket signal. The top arm of the taller post is the up starter while the arm on the shorter post is the up branch starter. The smaller arm lower down the taller post is a bow-tie shaped 'Calling On' or 'Draw Ahead' signal which presumably would have applied to up goods trains needing access to the yard. Fordham station on the 1887 1:2,500 OS map. Ely and Mildenhall are to the top left and Newmarket and Cambridge to the bottom right. The station building is shown in its original form but there is no sign of the signal box or of the footbridge. The goods yard can be seen with the shed, dock and coal yard shown together with the oddly sited cattle pens at the Newmarket end of the yard. West of the station building, the well is shown together with another structure, but no pump house is marked. To the north-west of the station the two approach roads can be seen; one for the goods yard and one for the station. At the time of writing both still exist but that to the station, in particular, is heavily overgrown. Running across the top of the map is Station Road and adjacent to the level crossing the two original staff cottages can be seen. At the extreme top left, Fordham North Junction is just visible. Fordham South Junction is situated just below the goods shed and the line from Burwell can be seen running in to join what was then the down station loop. The problems encountered by branch trains in gaining access to the goods yard are readily apparent. By the time this 1902 1:2,500 OS map appeared, things were a little more detailed. The signal box, weighbridge (‘WM’: in the goods yard) and footbridge are shown as is the second pair of staff cottages were provided iun 1890. Another structure has appeared adjacent to the well but its identity is not given. Changes to track layout at and beyond the Newmarket end of the station are apparent, these being the changes mentioned in the text which took place in the first decade of the twemtieth century. Despite impressions, as a result of providing a down reception road - originally just a siding - the main line is still single track at this time. On the Newmarket end of the up platform the second single-storey building has appeared. Its purpose is not known and GER records mention simply 'Addition to station buildings'. On this 1926 1:2,500 OS map further details are apparent. By now the pump house is marked as such; it is the rectangular hatched symbol, as the square unhatched symbol is known to have been the water tower. At the Ely end of the down platform another pump is marked. Quite what the purpose of this pump was is not clear but it was suspiciously close to the down platform water crane. At the Newmarket end further track alterations are apparent, including a trap siding on the down loop. This had been installed in 1907 at the same time as loop lengthening took place. The cattle pens appear to have been reduced to two. This view, looking towards Ely, is from a postcard bearing an October 1913 postmark. The orientation of the station house, which was the reverse of those on the Mildenhall branch-proper, is evident, as is the additional building between house and signal box which had appeared sometime prior to 1902, but after the station had opened. The station staff appear to be ready for a surge of passengers and their luggage but, as was invariably the case in those days, the scene is deliberately posed. The fact that the level crossing gates are closed to the railway tells us no train is due. On the right is stationmaster John Goddard. He became famous during his tenure for his wonderful display of roses in the garden of the stationmaster's house. The meaning of the white diamond fixed to the signal box is uncertain. It might be connected with the famous Rule 55 although the plate is the wrong shape, or it may be nothing to do with signalling. Perhaps somebody 'in the know' can clear up this mystery. The bracket signal in the left background has down starter arms for the main line to Ely and, on the shorter post, for the branch which swung away on a rising 1 in 660 gradient towards Isleham just beyond the level crossing. This view, looking towards Ely, is from a postcard bearing a July 1931 postmark. Oil lighting is still present although that on the footbridge pier appears to be gas. The signal box has by this time been equipped with the mirror. On both platforms loaded trolleys are waiting; photographic evidence suggests Fordham handled a reasonable amount of items for conveyance by passenger train until closure. At one time this was nothing unusual at any station, no matter how rural, but in Fordham's case there appears to have been more business with parcels and other small items than there was with passengers. Many of the changes at Fordham have already been described but sometimes descriptions are better in the company of an image. Note what appears to be a crossover just before the level crossing and the apparent double track over the latter. At this time the Ely - Newmarket line was still single track throughout but with station loops. 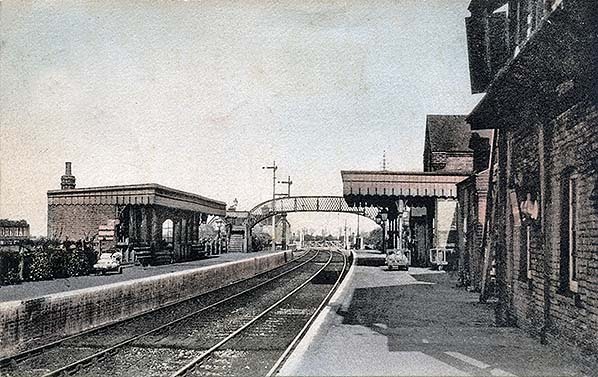 What appears to be a crossover was, in fact, originally the start of the platform loop, but in 1923 the loop was extended over the level crossing permitting up Mildenhall trains to enter Fordham up platform directly. This avoided conflicts between up Mildenhall and down Ely trains, which would have been likely as the main line was always was very busy with freight traffic. In 1938 the LNER doubled the track from Snailwell to Soham resulting in another change of layout at Fordham. The pointwork just before the level crossing was reversed so it was facing in the up and down directions. This allowed down branch trains to cross over and gain access to the branch via a new single-lead junction trailing with what had become the up main. Much later, when DMUs appeared, this arrangement permitted easy reversal for the Ely - Mildenhall services. The level crossing, once commonly referred to as Burwell Road, was a little further towards Soham, beyond the junction for Mildenhall. Station Road level crossing was unlocked from Fordham signal box and interlocked with signals in the usual way. A July 1953 view of Fordham up platform from the Ely end of the down platform. Everything is neat and tidy but there is no sign of any activity. The picture was probably taken during one of the (long) gaps between services. The station is now fully adorned with gas lighting and upper quadrant signals but BR Eastern Region signage has yet to appear. There are, however, plenty of BR posters present. Note the 'Way Out' is via the gate and not the station building; this may suggest the small building on the left was a ticket collector's office. The building is known to have been for staff use only as its door bore a sign to that effect. Direction indicators have appeared on the platform faces (they were applied to both platforms) and the mirror on the signal box is, at this time, mounted at the Newmarket end. The oil lamp which once graced the platform side of the signal box has been replaced by a gas light near the steps while on the taller signal post (these posts on bracket signals or gantries were known as 'Dollies') a standard distant signal has replaced the GER calling-on signal. Fordham goods shed on an unknown date but possibly just after the Second World War. The track through the shed continues into the dock behind the up platform. There is another track, just visible, running along the side of the shed which also connects to the dock. The tracks in the foreground at a right angle to the running lines are for permanent way trolleys - light enough to be manually lifted on and off the track. At one time working on the railway was very much a family and generation affair - still is to a much lesser degree. Permanent way gangs were based at intervals along a route, with each being responsible for a designated section of track. One such gang was based at Fordham, hence the facility for trolleys. On the Mildenhall branch the majority of level crossing keepers were the wives of members of the PW gangs. Indeed, this 'in the family' tradition was once common across the entire network and especially on branch lines. D16 class No.62562 appears to be very smart and has probably not long since been repainted into the second BR livery. This locomotive had been shuffled around a number of sheds during the 1950s and close examination shows she is carrying a 31B March shedplate; allocated here from March 1954 until withdrawal in October 1957, the photograph therefore dates from that period. She was one of the class to retain the ornate footplating applied when new but which, as attractive as it was, had begun to appear antiquated by the 1950s. The train, at Fordham's up platform, has not come from Mildenhall as the D16 class was prohibited from the Mildenhall - Fordham section. It is probably one of the Peterborough East - Ipswich or Peterborough East - Cambridge via Newmarket services. An undated view looking towards Ely. It is probably 1950s but before Eastern Region signage appeared. Two staff members converse on the up platform but, unlike the norm of earlier years, the picture is not posed. In the days of glass lantern slides posing was necessary due to the lengthy exposure time needed and having one's photograph taken was an event rather than a passing nuisance. Advances in technology and widespread camera ownership meant that by the mid twentieth century photography was less of a novelty and posed scenes, particularly of railway stations and their staff, became a thing of the past. At the moment Fordham was photographed, a train is due to pass through the down platform and head towards Soham and Ely. The lack of a human or parcel presence on the platform suggests that whatever is due will not be stopping. Note that the mirror on the signal box is now on the Ely end of the building.